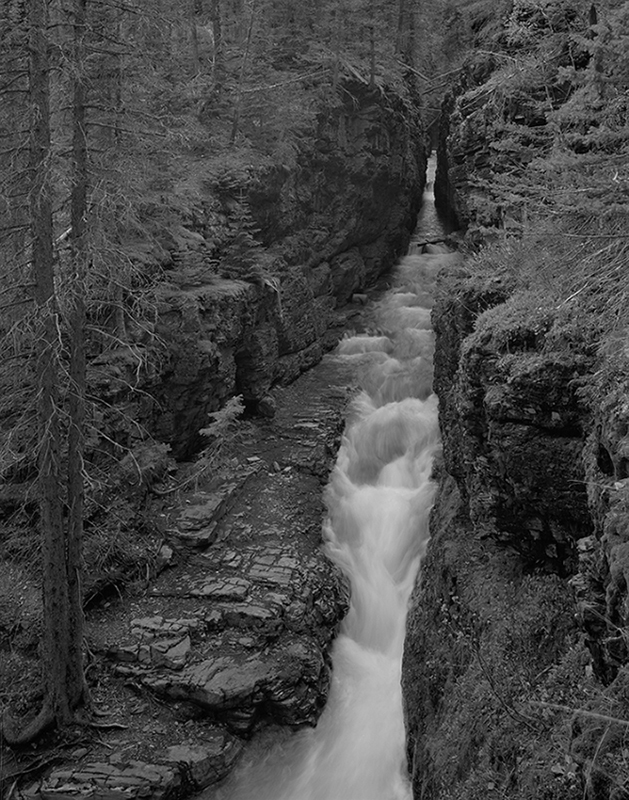 The ability of water to cut through rock can be seen clearly at Sunrift Gorge in Glacier National Park, Montana. The gorge is easily accessible since it is located only a hop-skip-and-a-jump (200 feet) from the Going-to-the-Sun Road. I was impressed with the straightness and narrowness of the gorge and thought it seemed odd that water which looked so silky and smooth could have enough power to produce such a deep wound in rock. The soft light at the scene increased the odd feeling that water could wear rock in such a marked manner. I set about making a black and white photograph which contrasted the silky smooth water with the surrounding trees and rocks. My goal was to achieve tonal contrast and textural contrast between the water and the rest of the scene. The dominant element of this photograph, however, was the water. Two major aspects of the scene required attention. First, the choice of shutter speed was critical because it needed to be slow enough to blur the water so it appeared silky smooth in the photograph but fast enough to capture the flow patterns. Experience is important in situations such as this and I was confident that an exposure speed of 1/4 sec would be about right for the scene. The second aspect of the scene which required attention was perspective control. Relatively high camera placement was required to obtain a good view of the gorge. A pair of tree trunks that were important to the photograph were located near the left edge of the composition and that was bad as far as perspective was concerned. High camera placement meant that the camera was pointed substantially downward. Pointing lenses up or down creates perspective distortions which cause parallel lines in the scene to converge (when the camera points up) or diverge (when the camera points down) in the image. For today’s photo, pointing the camera down without correcting perspective distortion would have caused the two trees near the left edge of the image to diverge strongly and appear to lean markedly toward toward the left of the composition. People viewing my photo would expect the two trees to point upward so left-leaning trees would appear unnatural. Numerous examples of unnatural distortion of these same two trees can be found on the web. To see examples of photographs taken from the same camera location as mine but without perspective control, search the internet for “images, sunrift gorge” and note the lean of trees near the edges of many photos. Note particularly images acquired with shorter focal length lenses since lens distortion is more marked for wider-angle lenses than for longer focal length lenses. Since I was using a slightly wide-angle lens, a substantial amount of perspective correction was needed to make the two trees on the left edge of my photograph point accurately upward as they did at the scene. Fortunately, I was using a view camera and could take advantage of its perspective controls. I mounted a 120 mm lens on my 4 inch x 5 inch view camera (150 mm is a “normal” focal length for 4×5 cameras) and roughly composed an image. Next, the camera back was tilted to correct the perspective distortion of the lens (make the trees point upward). My camera contains three small bubble levels which make perspective control adjustments quick and easy. Once the camera back was tilted, I carefully refocused the lens and then tightened all adjustment knobs on the camera. View cameras have many advantages and perspective adjustment is one of those. I acquired a few light meter readings with my 1-degree spot meter. The flat rocks laying next to the water in the foreground were placed on Zone V (middle-gray) and the bright areas of the water fell on Zone VII (bright with good detail). However, I could see that small areas of water momentarily became brighter than Zone VII because reflection of light by the water changed in response to its changing flow. Since the dominant element of this photograph was water, I couldn’t afford to “blow out” bright areas of the water so I played it safe to be certain that flow patterns were adequately captured in the water. This was done by specifying development on the film’s exposure record to be N-1 to darken the brightest tones in the photograph by one Zone (one f-stop). One Tri-X black & white film was exposed at 1/4 sec and f/32-45 (read as half way between f/32 and f/45). The 4 inch x 5 inch film was scanned at my usual resolution of 5,000 ppi (pixels per inch) and 16-bit pixel depth to obtain a high-resolution digital grayscale image of nearly one GB in size. I was happy with the gray tones on the film. I was especially happy with the amount of texture that was present in the water since flow patterns were easily visible in all areas of the water. The image obtained from the scanner without editing is shown below. The scanned image seemed to indicate that N-1 film development darkened the water more than desired. However, close examination of a magnified image on my computer monitor shows that small areas of water were quite bright and normal (N) film development would have lost texture in those areas since some near-white pixels would have been rendered pure white. Losing texture in the water would have been unacceptable in this photograph since water was its dominant element. As I usually do, I first opened a Levels Adjustment Layer to explore the image. PhotoShop’s Levels adjustment interface provides image histograms and the gray-level histogram for my scanned black and white film is provided below with dark-to-light tones displayed from left-to-right. The histogram shows that most pixels had dark or mid-tones and few pixels had bright tones. My reaction was to move the white slider toward the left to increase the population of bright pixels in the image. As I watched the image while moving the white slider, however, I noticed that important areas of the water became “blown out” (i.e. the areas lost texture) when near-white pixels became pure white. This indicated that the small population of near-white but not pure white pixels was necessary for the the soft and silky water that I desired. The effect of Levels adjustment is shown in the following four-part figure for a 1,108 pixel x 1,068 pixel area of the image. The top left part shows the scanned film without editing. The top right part shows a Levels adjustment added to the scanned film. 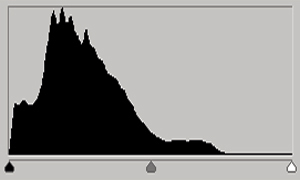 The Levels adjustment involved moving the white slider on the right side of the histogram toward the left until it encountered the beginning of the low, flat curve to the right of middle gray. That location was logical since it meant that the only pixels which were converted from bright gray to pure white were the tiny population of pixels in the flat line to the right of the low, flat curve. The top two parts of the figure show that some flow patterns were enhanced by the Levels adjustment but valuable flow structure in other water areas was lost because pixels were changed from bright gray to pure white. If the objective of a person’s photography is to display images on the internet, the loss of structure in a few areas of water might be acceptable since images are downsized markedly for web display and the blown out areas would appear very small on the internet. However, the objective of my photography is to make large prints which display fine details so areas that are textureless blocks of pure white generally must be avoided. I decided to forgo a Levels adjustment and use a different adjustment to do a better job of preserving flow patterns in the water (prevent the small but important population of near-white pixels from becoming pure white). 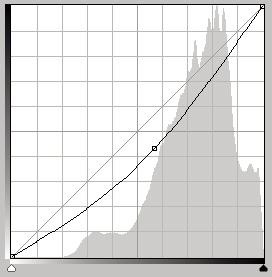 A PhotoShop Curve Adjustment Layer was opened and its user interface is shown below with tones that progress from light-to-dark beginning at the lower left corner (note that the histogram shown previously varied from dark-to-light beginning at the lower left corner). The curve was modified in a simple manner by dragging a point in the center of the curve downward to lighten all pixels (except pure black and pure white). Midtones were brightened the most whereas the small population of near-white pixels was brightened very slightly but not converted to pure white as they were with the histogram adjustment. The effect of curve adjustment on the entire image is shown below. It shows that curve adjustment brightened the whole image without losing texture in the water. Overall, the effects of curve adjustment were softer than the effects of histogram adjustment and a softer image was more appropriate for today’s photograph. The effect of Curve adjustment on the 1,108 pixel x 1,068 pixel area previously discussed can be seen by referring to the previous four-part figure. The top left part (scanned image without editing) can be compared to the bottom left part which shows the Curve adjustment added to the scanned image. This shows that flow patterns were preserved in the water at the same time the whole image was brightened. When the bottom left part (Curve adjustment) is compared to the top right part (Levels adjustment), it is easy to understand why Levels adjustment was abandoned and Curve adjustment was used. Finally, local retouching was performed using PhotoShop’s Burn, Dodge and clone tools. The original image layer (image from the scanner) was duplicated, named “Retouch” and placed directly above the original layer. Attention was directed first to the water. The goal of retouching here was to brighten the water overall and enhance its flow patterns. That was accomplished mainly by brightening its lightest pixels using PhotoShop’s Dodge tool when its tonal range was set to highlights. The effect of water retouching on the 1,108 pixel x 1,068 pixel area can be seen by referring to the previous four-part figure. The bottom left part (Curve adjustment only) can be compared to the bottom right part which adds retouching to the Curve adjustment. The combination of Curve adjustment and retouching clearly results in a superior image since it enhanced the water without losing any flow patterns. Comparing the top right (Levels) and bottom right (Curve and Retouch) shows that Curve and Retouch adjustments provided results that were far superior to the Levels adjustment. Next, retouching attention was directed to a few out-of-focus branches that entered the photograph near its lower right corner. The Dodge tool was used to reduce the visibility of the branches moderately. Finally, a few small distracting areas in other parts of the image were edited. These can be seen by alternatively viewing the previous image and the following image which adds the retouching edits. This photograph looks better when printed large because the rough texture of rocks and foliage is more visible and they contrast more readily with the many water flow patterns. 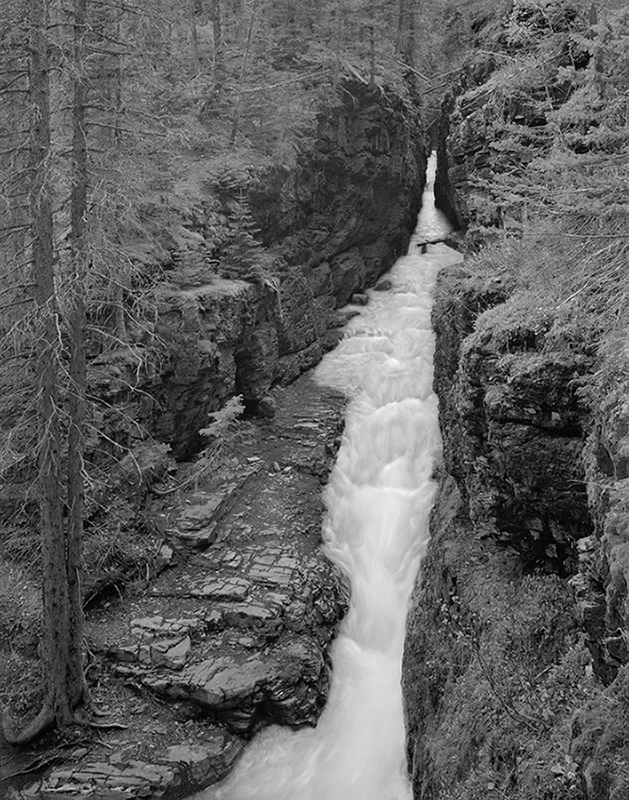 The subject of this photograph is silky smooth water flowing through Sunrift gorge. The water contrasted tonally and texturally with the rock and foliage in the rest of the scene. Any comments you might have about the image, the photographic approach used for it, its composition, or image workup will be appreciated. For a larger view of this photograph, visit here.